An original letter of correspondence between brothers and business partners Joshua Coffin Chase and Sydney Octavius Chase. Topics discussed in the letter include the letter from J. P. Campbell, the installation of a new plant, and Joshua's suspicions of Campbell. 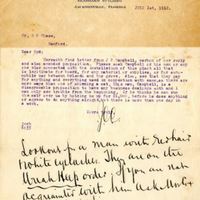 Original letter from Joshua Coffin Chase to Sydney Octavius Chase, July 1, 1912: box 49, folder 20.84, Chase Collection (MS 14), Special and Area Studies Collections, George A. Smathers Libraries, University of Florida, Gainesville, Florida. Digital reproduction of original letter from Joshua Coffin Chase to Sydney Octavius Chase, July 1, 1912. Herewith find letter from J P Campbell, carbon of our reply and also amended proposition. Please soak Campbell or his men or any one else connected with the installation of this plant all that is legitimate for board, for any material or supplies, or for automobile use between Orlando and the grove. Also, see that they pay for anything and everything used in connection with same, as there are more ways than one of skinning a cat. This man, Campbell, is a disagreeable proposition to have any business dealings with and I can only see trouble from the beginning. If he thinks he can run the calf over us by holding us up for $1,000. before he does anything or agrees to do anything alright, but there is more than one day in a week. Lookout for a man with red hair and white eyelashes. They are on the [?] order. If you are not acquainted with him ask [?] for a description. Chase, Joshua Coffin. 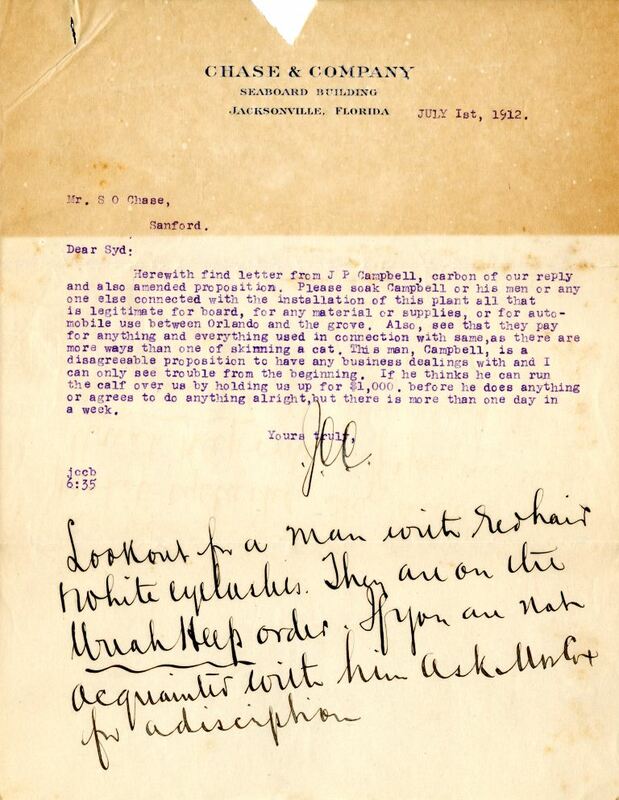 “Letter from Joshua Coffin Chase to Sydney Octavius Chase (July 1, 1912).” RICHES of Central Florida accessed April 19, 2019, https://richesmi.cah.ucf.edu/omeka/items/show/2723.